← Fat salaries for Radio and TV Marti, nobody sees in Cuba. On american taxpayer. The renowned Yale University Glee Club, led by Jeffrey Douma, will perform two concerts in Cuba next month, the Cuban news agency Prensa Latina reported Saturday (Feb. 8). 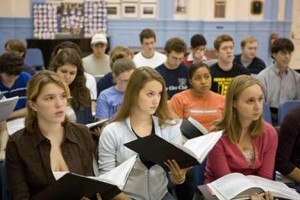 The Yale Glee Club rehearsing. On March 12, the choir will sing at the Church of St. Peter the Apostle in Matanzas, sharing the stage with the Chamber Choir directed by José Antonio Méndez. The following evening, the Yale singers will appear in Havana, at the Minor Basilica of the Convent of St. Francis of Assisi. In its Havana concert, the choir will perform a set of Caribbean music, including the music of Cuban composer Guido López Gavilán, and will share the stage with the Entrevoces Choir, led by Digna Guerra. The American singers’ visit to Cuba, March 10-15, will include cultural exchanges with local musical groups. From its foundation in 1863, the Glee Club, Yale’s principal undergraduate mixed choir and oldest musical organization, has represented the best in collegiate choral music. Its repertoire embraces a broad spectrum of choral music from the 16th century to the present, including Renaissance motets, contemporary choral works, folk music, spirituals, and traditional Yale songs. One of the most traveled choruses in the world, the Glee Club has performed in every major city in the United States. It embarked on its first overseas tour in 1928 and has since appeared throughout North and South America, Europe, Asia, Australia, and Africa. Its base is the university, in New Haven, Connecticut.